D9024S provides two-stage surge protection for floating I/ 0 signals of measurement and control and safety systems . With width of 6mm, it can be easily fitted into any marshalling cabinets or distribution cabinets. The SPD provides surge protection with 6 MHz bandwidth 4.7Ω Loop impedance . With disconnect knife on both signal paths features for easy testing of the loop. 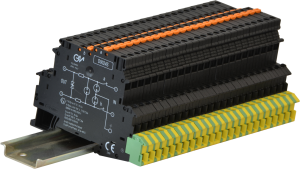 Surge protection for most I/O signals; AI, AO, DI, DO. Nominal 24V DC, maximum 36V DC. D9024S provides surge protection for all kinds of applications in different industries such as Oil&Gas, Petrochemical, Steel etc. Avoiding signal interruption and protecting control room equipment. Operating: temperature limits –40 to + 80 °C, relative humidity max 95 %. SIL 3 conforms to IEC61508:2010 Ed.2. T35 DIN Rail according to EN50022. Connection: screw terminal blocks to accommodate terminations up to 2.5 mm2 flexible. Location: installation in Safe Area or Zone 2 or Zone 1, Group IIC T4…T6. Dimensions: Width 6.2 mm, Depth 69.1 mm, Height 94.8 mm. D9324S provides surge protection for floating I/ 0 signal circuit in screw-on module with IP67 protection for sensor heads, connection ½ inch 14 NPT. Voltage Protection Level: ≤ 65 V (C3 – 10 A) core to core. ≤ 1.1 kV (C3 – 100 A; C1 500 A); ≤ 1.2 kV (C2 10kV/5kA) core to ground. Environmental conditions: Operating: temperature limits –40 to + 80 °C (non-Ex), relative humidity max 95 %. ½ inch NPT; direction of action Line-Line and Line-Earth Ground. Housing material: High-grade steel, silver colour . Dimensions: Width 28 mm, Depth 79 mm, Height 28 mm. Or for connection to a circuit in accordance with FISCO.